Tone 11 holds the Intention of Resolution. Tone 11 integrates a new perspective into our faculties of discernment. All our loose ends are drawn together to Resolve our new way forward. On Tone 11 the shaman make a climb to the Highest Altar to seek the Understanding of a Divine Discernment. The missing pieces filled in by Tone 11 will complete an understanding through simplification and improvement. The Truth we learned will become our own Common Sense. Deer/MANIK demonstrates a Meaning and Purpose that will make us Happy. That was the Creator’s Intention. Our path was created for a reason as simple as that. The Creator knew our Highest Experience of Living would be manifested through a Right Relationship of Loving and Forgiving. Holding that frame of mind and basic Intention, we would all be a Blessing to One Another. Love is the Power that can turn us all around. Earth/CABAN is the Day Sign of Mother Earth. Mother Earth holds All the Consciousness of Love there is on the planet. Earth is an Expression of the Creator’s Love. No matter what direction we look, the Beauty of the Creator’s Love is always right in front of us. CABAN is the Day Sign of Movement. Movement is a Sign of Life. So is Mother Earth a living thing. So does Mother Earth know the Darkness and the Light. So does Mother Earth have a purpose for always moving forward… a Divine Purpose. Moving was her Mission for us. With each new Sunrise our path will be Illuminated by the Light, the Creator’s Love. Earth creates for us the One Day to Another that makes our journey possible. She moves by Divine Intention to offer the Beginnings and Endings of each experience. Her movement offers us a possibility to complete a journey of Love every day. Earth/CABAN encourages us to keep moving on. The Cherokee Heron lives its life as a Migration, always looking for the next place of Abundance. The Heron is always moving toward the “next best place” To Be. We have to keep moving on to Know Love that goes on forever. The Movement of Mother Earth leads us from the joy of one day to another. On the path of the Deer, there will always be More Love Tomorrow than what was possible today. The Creator designed us to climb higher each day for a Higher Discernment of Unconditional Love. Climbing to see more Love from a Higher Perspective is a never-ending journey. There would always be More Love to See. In the 1st Uinal of our Germination, 4 Earth/CABAN was our foundation for stability. In the 2nd Uinal, 11 Earth/CABAN introduces Earth as our Higher Ground. In the 3rd Uinal, we emerge as the sprout into the Light of the world Above. The next gift ahead from Mother Earth will be an Empowerment for Moving in the Light, 5 Earth/CABAN. Earth is the Mother of Compassionate Love with the Duty to raise us up. Everything we need to Know, we’ll learn through Her Beauty and Movement. 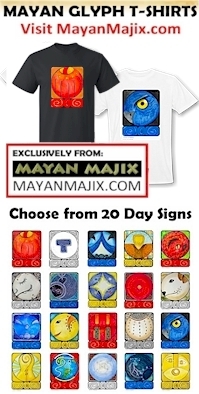 The Aztec Day Sign the Ollin (ah-lin) simply means “Movement.” The Aztec mark this day as “lucky for the active principle” and “unlucky for the passive principle.” Ollin clarifies the difference between forging our own path, and passively following along another. Creation requires us to make our own way. The paths we see around us can give us a sense of direction, but to walk our Own Path requires us to navigate our own direction. To stand on our own Truth, we have to know what it is. The steps of our path are different than any other. Ollin is said to be a day when we can see what we are becoming. The guidance of Ollin, is an “All In” effort of moving with all our Heart. What we need to know to advance from one step to another is a personal discernment. What is “right” for one depends on the Meaning and Purpose of the Time that was given to them. The “Truth we are learning” is always the Truth we needed to Know Now. We’re all in different places on our journey, what is best for one, is not necessarily best for another. We are all becoming “experts” of Love, and we’re all attending a different school of thought. We each have a Mission for our Life and for each Day. An army of warriors isn’t very effective, when every member of the troupe is performing the same task. The big job at hand means some will be Forgiving, others Comforting, others inspiring Bravery, and some Offering a Helping Hand. Some will Serve to Love the land. Others will Love the animals. Some serve the old, and others the young. Some will create Beauty for the Sake of Love. We are each perfecting the facet of our own Light. Our path will be special from any other. We’re each climbing to our own Highest Ground of Love. To be a good Leader of Love, requires us to See and Acknowledge how many paths can all lead to the One Destination of the Creator’s Love. I’m convinced that we’re all working very hard toward what we see as our own “worst flaw.” Every Time has its own Purpose. I know I can be working very hard at something, and be encouraged by my own progress, just to find out I’m screwing up royally somewhere else. A Mission of Unconditional Love ASSUMES the Love in all of us. It assumes that if we’re living, we’re looking for Love, we’re trying to Love our Self. If we Believe in the Light within our Self, we can Believe that a Light is trying to Shine through each one of us. We must Honor EVERY path that follows a Mission of Love. There is a need by Humanity for every kind of Love we can Give. We were designed to fulfill our own very special Mission of Love. We all HOPE that someone else could see us in our Highest Intention. That’s what the Deer volunteers as the Hand of God to do. Today is a day to open our Heart to Mother Earth, and to see that she’s created a special place for every Human. Earth is our Endless Resource for Love. There’s no place we could Be that doesn’t reveal a dynamic illustration of the Creator’s Love. By our Human Nature, we’re always in need of something “more.” A Provision of a Divine Creator even provided for that. If we just keep moving on, we’ll see how Love climbs Higher, Eternally. The Heron is a symbol of the Phoenix that rises from the ashes of its past. Today we can rise to the Simple Truth that More Love always lies ahead when we make Love the Mission of our Life. With each Sunrise we’re given another chance to Rise to a New Beginning. We can stand on the Truth of Love we Knew Yesterday, as the Higher Ground that will lead us to a Higher Love tomorrow. CABAN calls us to Seize the Day as the Opportunity that’s right in front of us. What we Love today, will create a new tomorrow. There’s no place on Earth we could be that wasn’t Sanctified and Blessed as Perfect from the One Mind of Divinity. Wherever you are, you’re standing on the your own Holy Ground. God Created the “Time and Place where we are” as always the Right Place to Know Love. Wherever we are, God left the evidence to see it. Whoever we are with, God left the evidence in them. God’s Love is everywhere, seated in everything that’s Loved without Condition. A Divine Creator Resolves the path of our Mission to its Time and Place in the Universe. It’s Here and Now. It’s always Here and Now. Through a Provision of Divine Guidance this is where we arrived. Our Holy Ground is always right beneath our feet. Tomorrow’s Holy Ground is one step closer to Unconditional Love. Our Hearts are all connected through Mother Earth. There’s been a lot of sorrow to carry this week. I’m feeling the same sorrow I felt for Flint, Puerto Rico and the Children – the sorrow of injustice. There is injustice. We’re only given a way to navigate around it. All the people out of work weighs heavy. I wondered why I could hardly leave my bed yesterday. I’d thought this tragedy hadn’t personally touched my life yet. Then I remembered this weight from tragedies before. Our hearts ARE connected. We can volunteer by Divine Intention to help carry the burden. We can stand by like CIMI the comforter, believing in a Divine Provision and a Blessing in the Future on behalf of every Human Being who suffers. May we acknowledge a whole herd of Deer searching for Higher Ground, each one striving for a Higher Place to Be. May we Know in the Reaching, the heartache we share in our limits today. May we see that we are equal, in all the different ways of reaching for the Light. May we Know that sharing a Path to Love doesn’t mean we’re all on the same Road. A Divine Creator made all ways possible. May we know that whatever our own Road may be, in every path of Love, we are no less following a direction that leads home to the Consciousness of Unconditional Love. Just like Mother Earth, Humanity was meant to reveal Beauty through all the ways we are. May we bring our Love to Mother Earth as a Offering of Sacred Exchange for the Beauty that’s always with us that calls our Hearts and Minds to Love. OFFERINGS TO THE MOTHER: The Elders taught that wherever we make an Offering to Mother Earth, we sanctify the Time and Place of Holy Ground with an Offering of Cornmeal, Tobacco, Water, or a Blessing from our Self – our saliva or a piece of hair. The Elder on the Andean shamanic path taught us to use floral water to bless the spot. The purpose was to awaken the field of Consciousness to the place where we are. May we Kneel in the Presence of her Beauty, Offering the Gift of our Consciousness, as the only Offering that’s ours to Give that wasn’t first given by Her. May we Bless the Whole of Mother Earth acknowledging ALL of her as Holy Ground. IF YOU ARE THE ONE WHO SUFFERS: Mother Earth is always present to receive us in her arms for a healing. Earth was the first place the Elders would take us when we come to a breakdown. We were told to lie face down, connecting ALL of our Self to the Earth. They threw a blanket over us and left us there. Earth holds the magic of grounding and drawing off negative energies. One of the small ceremonies of Spiritual Tools we were given was to bury things in the Earth. The Earth changes things into something new. We could assign the healing to any object we bury, to leave something that no longer serves behind. Ask Mother Earth, and leave something of your Self behind. ALL CEREMONY CAN BE CREATED IN ANY REALM OF BEING. THE CREATOR MADE A PROVISION SO THAT SACRED CEREMONY AND THE COMMUNION WITH ALL THINGS IS NO LESS AVAILABLE TO ONE HUMAN THAN ANOTHER IN ANY TIME OR PLACE. A PROVISION WAS MADE FOR EVERYTHING. 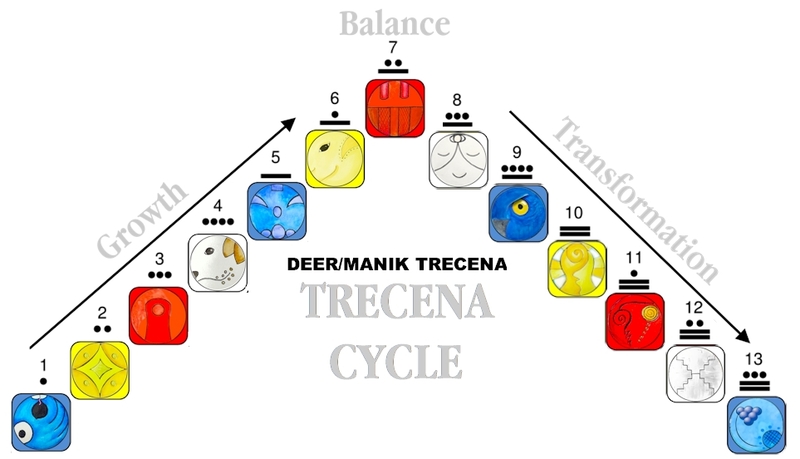 Visit the 13-Day Trecena Guide for a forecast of Deer/MANIK trecena energies.